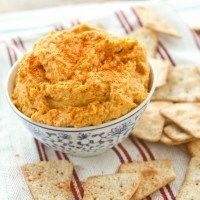 Sweet Potato Hummus with Curry | Naturally.Sweet Potato Hummus with Curry | Naturally. Bring a pot of water to a boil and add sweet potatoes. Cook until sweet potatoes are soft, 10 to 15 minutes (depending on size of cubes.) Reserve one cup of water as you drain the sweet potatoes. In a food processor combine all ingredients except the reserved water. I started with only 2 teaspoons of curry powder and continued to taste and adjust. Begin to run food processor and drizzle cooking liquid one tablespoon at a time into hummus, adding just enough water to smooth out the hummus. Hummus should be creamy and smooth. Remove from food processor and store in an airtight container in refrigerator for 4-5 days.